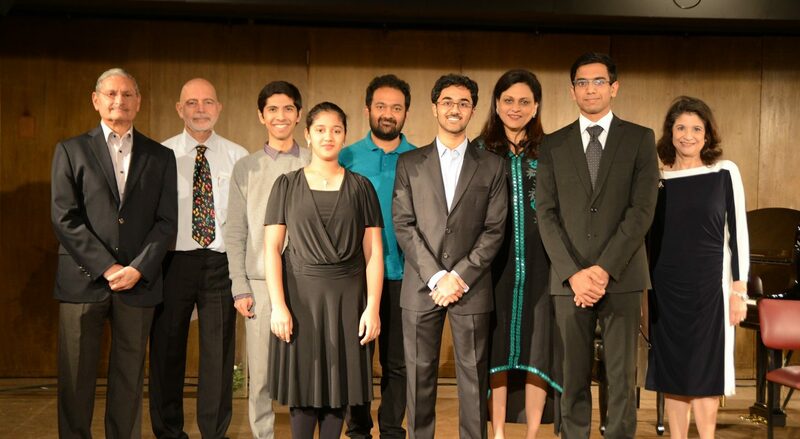 Kabir Dabholkar of Bangalore (2018 YMOY), who is balancing his passion for the guitar with pursuing a MS degree at IISER Pune, began the program with two selections from the Cinq Preludes by the 20th century South American composer Heitor Vill-Lobos. The melancholic bass line that animates the first prelude was performed with a rich, well sustained tone, and generous amounts vibrato. Villa-Lobos – a cellist, would surely have approved. The Violin Concerto in E Major, BWV 1042, by J. S. Bach, was then performed by violinist and joint winner of the 2019 Young Musician of the Year award R. Samyuktha, a grade 11 student at the Kalakshetra Foundation in Chennai. The first and third movements possessed a solid rhythmic back bone and the doleful second movement (Adagio) was exceptionally well handled by Samyuktha; expressive and mature playing beyond her years. Shirish Malhotra, the 2015 YMOY recipient then performed two selections from the Histoire du Tango by the Argentine tango composer Astor Piazzolla with duet partner Dabholkar. Malhotra was quick and agile in the virtuosic passages and possessed an exquisitely tasteful vibrato. Piazzolla is known for writing parts that do not fit well on the fingers of guitarists, yet one would not have guessed judging from Dabholkar’s smooth performance of Cafe 1930. The second half of the evening began with 3 pieces by the 18th century Spanish guitarist/composer Fernando Sor. Dabholkar was clearly in his element here, performing sensitively, with a well elevated singing melody, and with a clear understanding of Sor’s impeccable voice leading. Pianist and joint YMOY 2019 recipient Anuvrat Choudhary then performed the Hungarian Rhapsody no. 6, by Liszt, and the Impromptu no, 3 by Schubert. Choudhary created a wonderful harmonic soundscape with his fine use of the sustain pedal; just the right balance that allowed these lyrical pieces to sing. Mr. Dabholkar completed the program with the Elves Suite, by contemporary Russian composer Nikita Koshkin. The impish and mischievous character of these five short dance movements was established via Dabholkar’s excellent control of staccato articulation, comical glissandi, and insistent rhythmic drive. An encore was presented by Dabholkar and Malhotra performing on the guitar and the Charango; a small lute-like instrument from South American. The two performers took turns improvising on the traditional piece entitled Charanguistas Chilenos and the crowed showed their approval with a rousing applause. I could not help thinking that, had Mrs. Craen been present, she might have told these young performers “there will be many pennies in your tray today!”. This review has been co-authored with Emilee Feely. A pianist and music entrepreneur, she was sent to India by the Canadian government to explore potential business partnerships between the two countries. Patrick Feely has performed with the McMaster University Orchestra, Grand River Players, and the Brantford Symphony Orchestra. He is faculty member at McMaster University and the University of Western Ontario, teaching guitar pedagogy, private instruction and guitar orchestra classes. Mr Feely is a guitar specialist with the Royal Conservatory where he assesses guitar candidates of all levels across Canada and the USA. His students have been accepted into Undergraduate and Graduate performance programs across Canada and Europe. Patrick is currently pursuing the PhD. degree in Music Education at University of Western Ontario in Canada; his research interests are in music psychology and self-regulated learning. Patrick and his daughter Emilee have been performing and speaking in India as part of an exchange program between the Canadian and Indian governments, the goal of which is to encourage trade between the two countries.